It was the introduction of the Iowa Life-at-Conception Act (H.F. 297) in the Iowa House with a whopping 23 cosponsors! Honestly, we have so many battles raging in the Iowa House right now I can hardly keep my head on straight. But forcing a public, roll-call vote on the Iowa Life-at-Conception Act on the full floor of the Iowa House remains at the very top of my priority list — and hopefully yours too. You see, if passed, this legislation would finally END abortion-on-demand across Iowa by using the U.S. Supreme Court’s own words in the 1973 Roe v. Wade travesty against them. With the bill now introduced with an impressive initial tally of cosponsors, it’s up to you and me to ensure weak-kneed members of the House Committee on Human Resources don’t succeed in killing the bill or sweeping it under the rug! So won’t you please sign and submit your petition to the members of the Iowa House Committee on Human Resources that I’ll link you to in just a moment? As you’ll see, this petition insists that members of the Human Resources Committee vote to PASS H.F. 297 which would set us up for a vote on the full House floor! Unlike other “pro-life” bills, it’s not designed to just “whittle around the edges of abortion.” Nor is it a “protest bill” that would immediately be struck down by a court the moment it passes. You see, in the tragic 1973 Roe v. Wade ruling, the Court noted that if life was ever declared to begin at conception, then unborn babies MUST be protected by the U.S. Constitution. Whether the pro-abortion crowd wants to admit it or not, from the moment of conception, unborn babies are genetically human, scientifically alive, and have DNA distinct from their mothers. 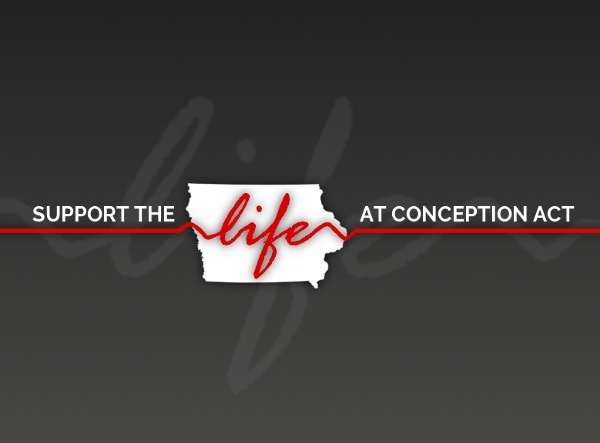 The Iowa Life-at-Conception Act (H.B. 297) would simply legally recognize that FACT, provide stiff penalties for abortionists — and save tens of thousands of innocent lives in the process. So please, sign your petition right away in support of this crucial legislation! These are the politicians who stall and often kill pro-life legislation behind the scenes. In fact, these self-described “pro-life” politicians are often the chief roadblocks to saving innocent, unborn life! Just holding this vote will prove once and for all which politicians are truly pro-life — and which just mouth pro-life rhetoric to get elected. And once pro-abortion politicians are exposed, they’ll go down in defeat when faced with re-election. Pro-lifers will make sure of it. Before any of this can happen, you and I must force the Iowa Life-at-Conception Act out of the Iowa House Committee on Human Resources. That’s going to take an outpouring of pressure from good folks like you. That’s why it’s critical you sign and submit your petition IMMEDIATELY. >>> Turning on the phones, contacting pro-lifers all over the state to urge them to call their elected officials. But putting this plan into action will take valuable resources — resources I just don’t have laying around in Iowa Pro-Life Action’s bank account — especially with the fight to DEFUND Planned Parenthood raging as well. So I hope I can count on your most generous contribution. The truth is, I’m afraid if we don’t mobilize now, we’ll miss out on an historic opportunity to save thousands — perhaps tens of thousands — of lives, while the political winds are blowing our way. So in addition to signing your petition, please agree to your most generous contribution of $100 right away. With your help, I’m convinced we can force the General Assembly on record on this critical bill, and take a giant step forward in our battle to save innocent lives. But it won’t happen without our efforts. It’s time for pro-lifers to take a stand. It’s time to insist on a public, roll-call vote in BOTH houses of the General Assembly on the Iowa Life-at-Conception Act. So please act at once. Please sign your petition and agree to your most generous contribution of $100, $50 or at least $25 TODAY! P.S. With the Iowa Life-at-Conception Act (H.F. 297) now introduced with an impressive initial tally of 23 cosponsors, it’s up to you and me to ensure weak-kneed members of the House Committee on Human Resources don’t succeed in killing the bill or sweeping it under the rug! That’s why I’m counting on you to please sign and submit your petition to the committee right away! When you’re finished, please consider giving us your most generous contribution of $100, $50 or at least $25 IMMEDIATELY, to help us mobilize more pro-lifers here in Iowa! ← Bill to Defund Planned Parenthood Moving Forward!